It was one of the most devastating days in American music. Thirty-five years ago Saturday, a plane carrying the band Lynyrd Skynyrd ran out of fuel and crashed in Gillsburg, Miss., killing six people, including lead singer Ronnie Van Zant and siblings guitarist Steve Gaines and vocalist Cassie Gaines. The band's pilot, co-pilot and assistant road manager also died in the crash, and many more were injured. 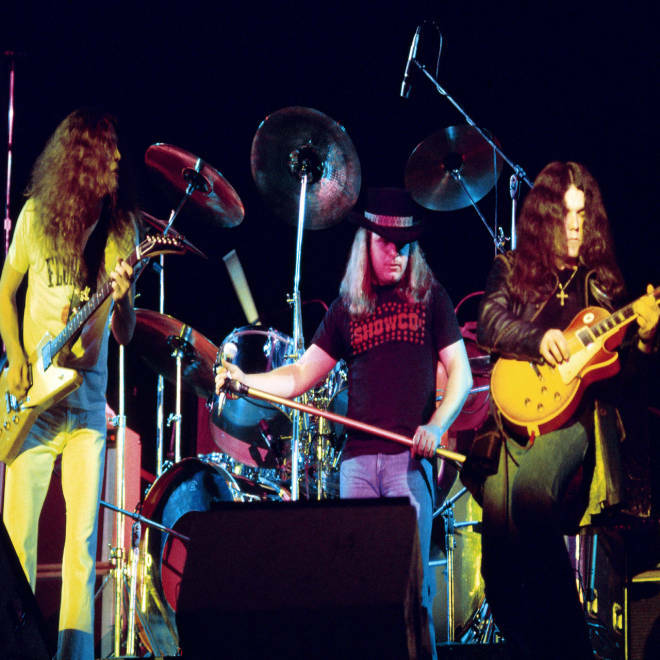 Lynyrd Skynyrd performs in 1976, a year before the plane crash. The site TennesseeConcerts.com lets interested persons read about the crash as it was covered in real-time by the local paper, the Enterprise-Journal. The newspaper's front page was given over to the disaster, with a horrendous photo of the wreckage showing that the plane pretty much split in two. Rescuers had to cross a 20-foot-wide, waist-deep creek and dig through a forest so overgrown and untouched that some emergency vehicles got stuck in the mud on their way to the scene, the Enterprise-Journal reported. The paper also quotes a local resident who was approached by bloody survivors, one of whom hugged him around the neck while saying "we got to get them out." Three days before the crash, the band had released its latest album, "Street Survivors," which originally featured a cover showing the band surrounded by flames (it was quickly changed). The album became a hit, but the decimated band broke up, only to reunite in 1987 and begin touring again. Their music lives on -- "Sweet Home Alabama" especially has a permanent place in American rock history. A whole generation of fans who love the song weren't even around for the crash, which has passed into shadowy musical legend. In the 1997 Nicolas Cage movie "Con Air," as "Sweet Home Alabama" plays, Steve Buscemi's character says, "Define irony. Bunch of idiots dancing on a plane to a song made famous by a band that died in a plane crash." He wasn't quite right. While the crash would seem to have destroyed the entire band, that isn't quite true. Lynyrd Skynyrd is currently touring Florida and about to move the tour to the United Kingdom. But the echoes of that day 35 years ago still resonate for those with a lengthy musical memory. Do you remember the Skynyrd crash? Tell us on Facebook.